I will try again. Yin and Yan, positive and negative, good and bad, pollo y gamba… Again another horrible start. Maybe today I shouldn’t write a post and take a beer and some pinchos de tortilla de patatas and enjoy the sun in my face while drinking and eating in my terrace :D… and this takes me back to… night and day, light and dark… enough of this! 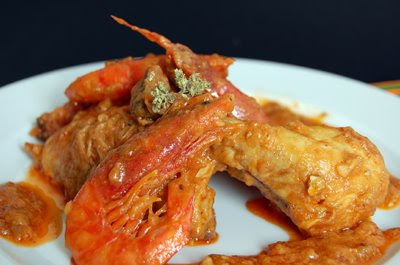 Mar i Muntanya is a typical Catalan dish where sea and land flavours combine to perfection. Just pick the best ingredients, and prepare a rich and thick sauce… there you have it! Don’t forget the bread! This dish will be wonderful some hours after its preparation. Enjoy!!! 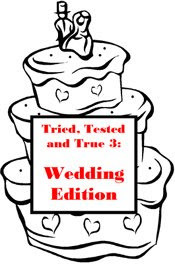 I’m sending it over to Psychgrad and her Tried, Tested and True… Wedding edition… for the husband and the wife, in health and illness, for good and bad… for a wonderful wedding and a fantastic life ahead!!!! This dish might look a bit complicated… but it’s not; I just wanted to send you a typical Catalan dish for your wedding :D.
Next post will be about chicken again but in a pickle and this is probably more suitable since you can cook it days ahead and prepare the chicken salad in the last moment… I think I’ll send it to you too :D. Meanwhile, enjoy your last single days ;D.
Veal’s tongue in vinaigrette sauce… Mmmm soooo good! Potatoes Rioja-style… the best comfort food ever! Carrots puree with Iberian acorn ham… have it cold or warm. Ingredients for 6 servings: 1 1/2 chickens, 30 fresh shrimps, olive oil, flour, 2 big onions, 5 garlic cloves, 6 ripe tomatoes, 2 table spoons of apple spirits, 2 dl of chicken stock, 20 grs of toasted almonds, 20 grs of toasted hazelnuts, herbs: bay leave, oregano and thyme; salt and black ground pepper. Clean, wash and cut the chicken in 12 pieces (aprox). Keep the liver aside. Sprinkle with salt and black pepper and coat in flour. Shake to leave excess flour in the plate. In a big sauce pan with a generous amount of olive oil, fry the chicken pieces and when golden reserve in a big casserole. Prepare the shrimps: cut the long whiskers and wash a bit. Dry them and salt and pepper. Coat in flour and fry in the same oil used for the chicken. 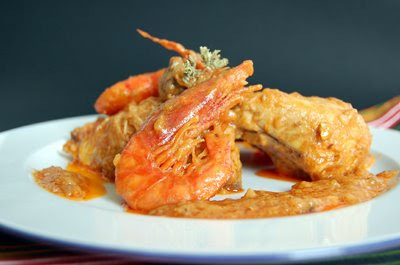 If there's too many flour in the oil, strain and use the clean one for the shrimps. Fry them for only 30 seconds per side. Reserve. Take some of the oil used in frying the chicken and shrimps and cook the chopped onion and when transparent, add 2 chopped garlics, stir with a wooden spoon and when fragrant add the tomatoes (peeled and grated). Reserve the rest of the oil. When the sofrito is done: the tomatoe has loosed all its water, add 1 teaspoon of flour, the herbs, and the chicken stock. Cook at medium heat for 5 minutes. Pour it inside the casserole where the chicken is waiting. Cook for 30 minutes or until the chicken is tender at low heat and with the lead half covering the casserole. When it's done, pick the chicken pieces and reserve in a plate. Pour the sauce in a food processor and blend. Take the chicken and the sauce back to the casserole. Prepare a "picada" (that's a Catalan late dressing) with the almonds, hazelnuts, apple spirits, 3 garlic cloves and the chopped chicken liver. Picada means smashed; so take your mortar and smash all the ingredients. Pour inside the casserole and let it simmer all together for 10 minutes. Stir. Just 5 minutes before the dish is done, add the shrimps and stir a bit more. 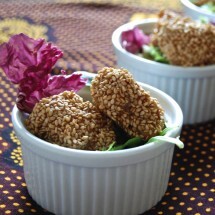 What a delicious recipe and wonderful photos! I was fascinated by the photos of the chicken. I especially liked the photo at the top, of the chicken’s feet. In the U.S. chicken is sold much more, er, processed. 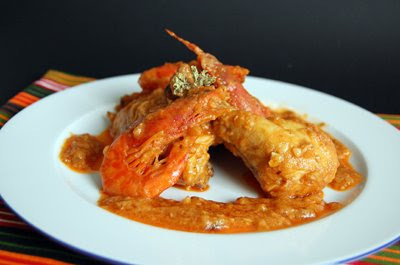 Chicken and shrimp is always a great combination and the Catalan dressing is a wonderful touch. I have always wanted to learn more about Catalan cuisine so your blog is a goldmine! oh, Nuria, the first photo makes me want to shut my computer! I was not so happy with the 4th one either but I opened my eyes long enough to read the recipe and admire the finished results. It looks muy sabroso. You always have the most interesting dishes Nuria. What a gorgeous presentation and thank you so much for helping us with the buffet table. Is that chicken feet in your first picture? Thank you for the lovely recipe. I’m sure my guests would be very impressed with this dish. They would think I’m so worldly with Catalan dishes. Oh cool! Your chicken is WHOLE-whole! The head even has the comb! 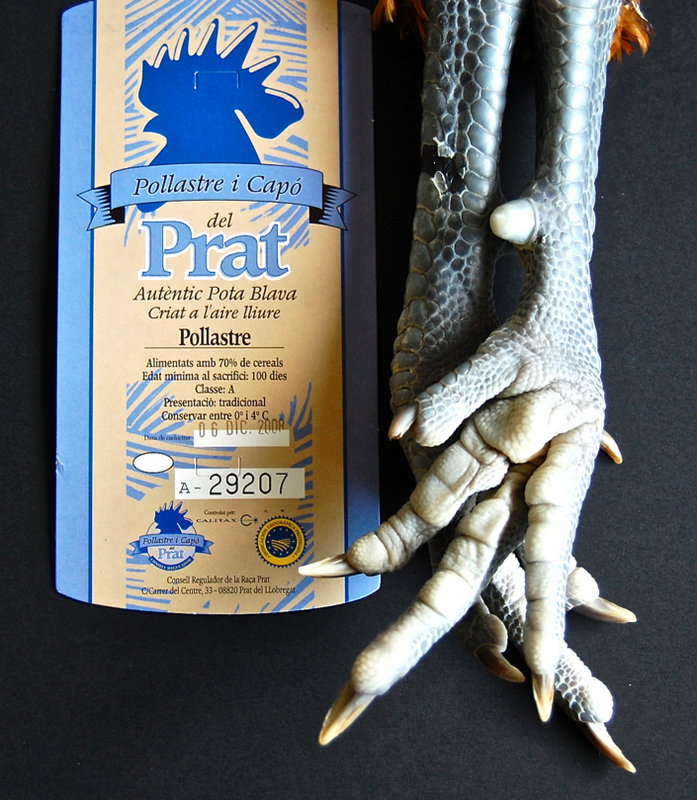 La cresta y las patas are supposed to be a delicatessen… however, I never tried them! Ha, ha! Sorry Joan, I see how impressed you are! But this is what it is, isn’t it? I don’t mind taking the guts outside myself nor cutting it into pieces… believe me, it’s worth! This chicken was superb! Hola Giz and Psychgrad! I know you would love the final result of this dish but maybe I have been a bit too weird with the pictures… for us is not that rare. So next post will also go to TT3. Hola Vancouver! Si! 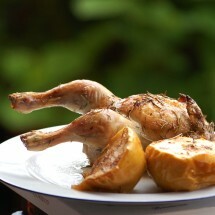 This is the look of organic and raised in freedom chickens :D… not to talk about its taste! Hola Peter! Surf and Turf sounds so funny :D.
Aquesta recepta és la favorita del meu xicot. La provarem ben aviat! That looks absolutely delicious, Nuria – why a bad start? I’m all for tortillas de patatas and wine and sun, though! 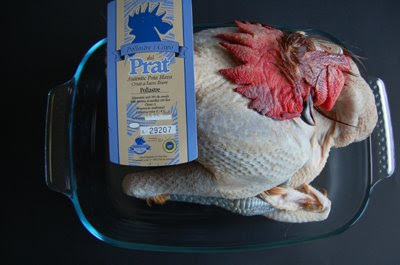 Is this blue chicken the same species as the famous French one? Nuria, I am LOVING this combo and the dish looks fantastic. what gorgeous pictures! i love that you push the envelope w/ some of these pics. chicken feet crack me up. i’ve said it once (or twice) and i’ll say it again – no one does seafood and meat together like the spanish. this really looks delicious. 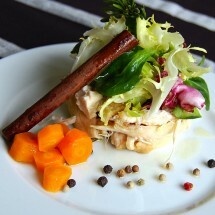 Mar i Muntanya is a combination which is not usual in Greece but I have to try it as the dish sounds amazing. What a great recipe with so many flavors. A beautiful disg for the newlyweds to start their new life. Pero… tu estas a Barcelona? M’he trobat de cop aqui i veig receptes de la nostre terra i a mes estupendas. Hola Marisabel! Sí, jo estic aquí ;D. Visc molt a la vora de Barcelona. Moltes gràcies per les floretes :D, ara mateix vaig a visitar el teu blog!